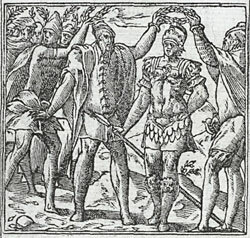 Alciato at Glasgow: Emblem: Optimus civis. Palladiae sertum frondis habere dedit. In magna nemo est aemulus urbe tibi. Thrasybulus was avenging his country with righteous weapons and bidding every person lay aside his enmities; so every class in harmony granted him by way of great reward the wearing of a crown of Pallas’ leaves. - Wreathe your hair, Thrasybulus; you alone are to wear this honour. There is no rival to you in the great city. 1. Thrasybulus of Steiria, after a distinguished military career, was instrumental in liberating Athens from the tyranny of the Thirty in the political confusion at the end of the fourth century BC. For his own moderation and his resistance to vengeful acts by others in the ensuing settlement, see Cornelius Nepos, Life of Thrasybulus 3.2-3. According to Nepos (ibid. 4.3) Thrasybulus interpreted the olive-wreath freely offered him by the citizens as a sign that he was held in supreme honour by them. 2. ‘of Pallas’ leaves’, i.e. the leaves of the olive tree, sacred to Pallas Athene, patron goddess of Athens.